Properly garbed for safety, three interested visitors are pictured during their tour of the Praxair facility on Ucar Street, off East Street South. From the left: Town Planner Bill Hawkins, First Selectman Melissa Mack, and Kevin Bielmeier, consultant from the Connecticut Economic Resource Center. Their tour was led by Praxair’s Facility Manager, Moiz Ahmed. Praxair, formerly known as Union Carbide, is a global company headquartered in Danbury. Their Suffield facility, opened in 1966, operates 24-7, producing three cryogenic liquids: nitrogen, oxygen & argon. The facility has many clients across the northeast, serving many markets including aerospace, with such clients as Pratt & Whitney and other divisions of UTC. 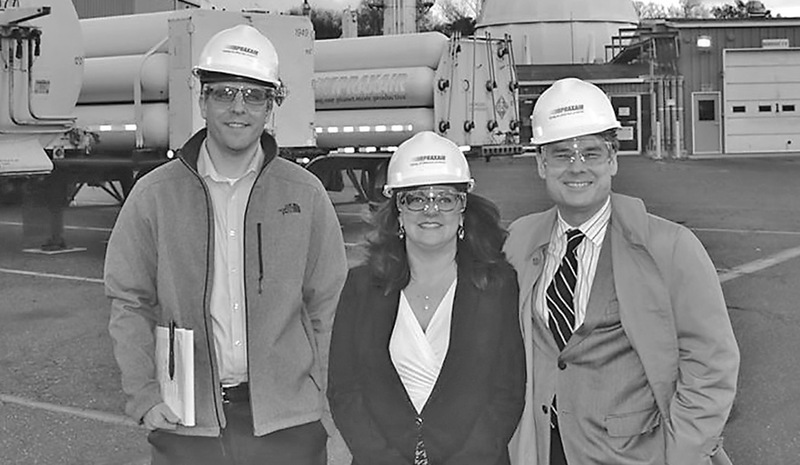 A Suffield delegation recently visited Praxair as part of an ongoing initiative by the Town to visit businesses, learn about them and examine how the Town can best serve the business community.